The weekend we went to the Christmas markets in Salzburg, we initially had planned to go to Munich, but as the Bavarian Christmas markets open later than the ones in Austria do, we had to wait one week more. But our wait was definitely rewarded. Different than in Salzburg we had beautiful weather as it was mostly sunny with a few clouds and not too cold. Even though we’re not made out of sugar it’s definitely nicer without rain. Also, we managed to meet up with Sophie’s cousin, which made the day even better. Munich is even closer to Innsbruck, than Salzburg is. You can easily reach the city centre within less than 2 hours depending on the traffic. We visited two different Christmas markets. First, we took the subway to the Theresienwiese, the location, where, in September and October, the world-famous Oktoberfest takes place. During Winter, the event that takes place there is called ‘Tollwood’, which is a very different to the Christmas markets we are used to. 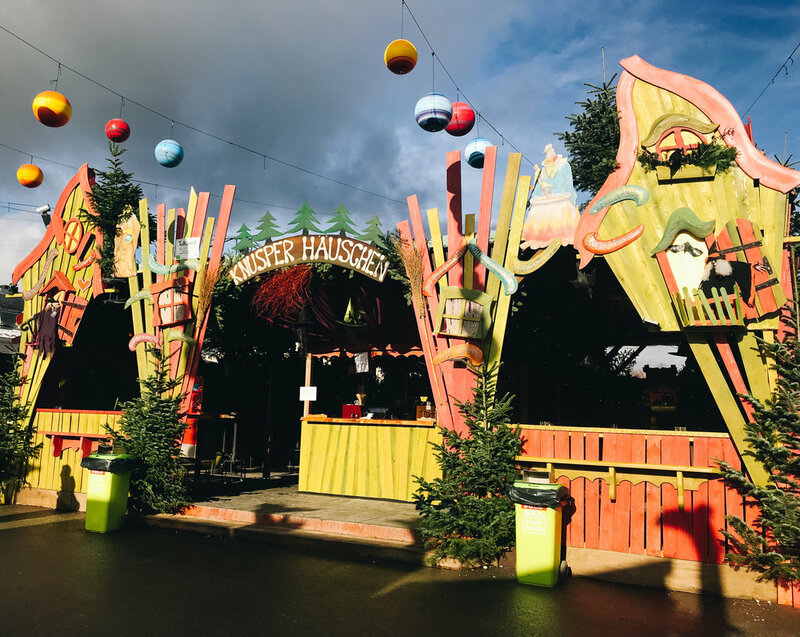 It’s a bit alternative and modern and, just like the Oktoberfest, there are many different tents where you can either buy handcrafted and unusual gifts or eat the most delicious food. What’s really uncommon for Christmas markets: they offer international food, so Sophie opted for Pad Thai and Natascha chose Pasta with cheese sauce that was even prepared inside a big cheese loaf of Grana Padano. Yummy! Until noon the market is less crowded, which makes it easier to explore the different stands and goods, while in the afternoon it gets packed, which is why we chose to change scenery and head to the Marienplatz in the city centre. Again, we took the subway, which is a very cheap and fast way to get around Munich. A ticket from the Theresienwiese to the city centre is about 3 €. The market in the city centre, of course, is even more crowded than the first one, but it’s more traditional. Here you get typical Bavarian food and drinks and small, traditional, handcrafted gifts for your loved ones. The only thing that really caught us by surprise is that this market is way more expensive than the ones we are used to in Austria. Sometimes the prices for mulled wine were nearly double the standard price in Austria. But nevertheless, it was a great evening and after a quick dinner at the Augustiner Bräu, a very famous and tradtional restaurant in Munich, we headed back home. All together, we think it’s safe to say that everyone will find what they are looking for in one of these markets. 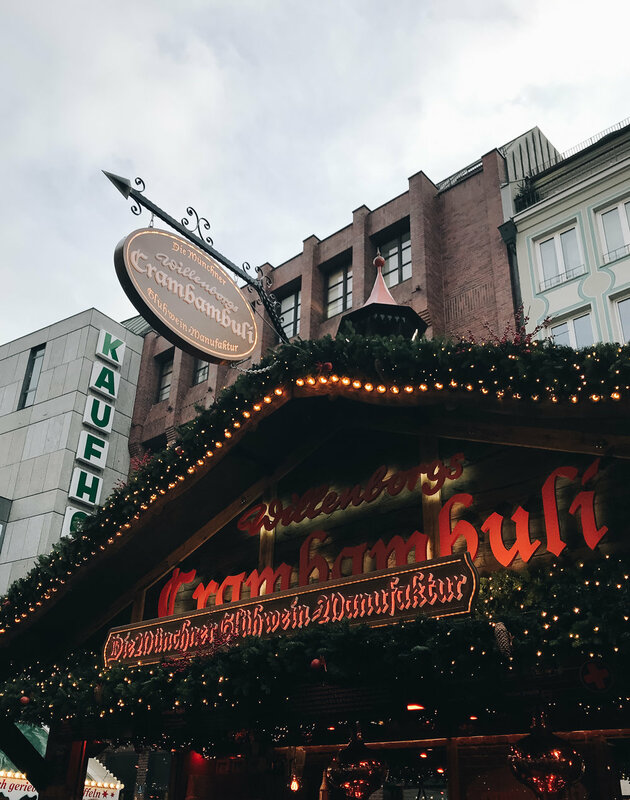 For those who like their Christmas markets to be more traditional and oldschool, we definitely recommend the market at the Marienplatz, while especially young people like us definitely are going to enjoy the ‘Tollwood’ and all its alternative and special goods. We will come back next year for sure! If you are interested in our full Christmas Market-series, just click on the link below to find them all at once.